Space for 52 cm long graphics card & 280 mm radiator. More links for "Enthoo Evolv Shift X Mini-ITX Tempered Glass Case - Gunmetal Grey"
Amazing case, build quality is the best I've worked with. All the panels come off in seconds to give maximum access. I can also confirm you can fit an ATX PSU in which is great as SFX are often double the price per watt. Even with an ATX in place you can fit a 280mm radiator. Just to top it off you can fit a full length GPU in. The only negative about the case is it'll be a hot one as there is restricted air flow. You could expect +5 -10 degrees compared to a better ventilated case. The case is designed for a full water cooled setup so perhaps that would solve that. 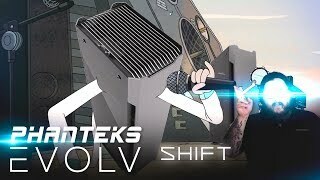 Phanteks Evolv Shift X will appeal to the individual, rather than the mainstream.